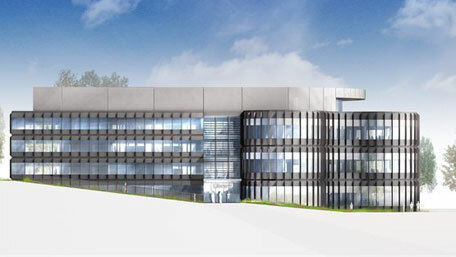 The University of Nottingham's new Engineering and Science Library is the latest landmark development to be undertaken on the University Park. 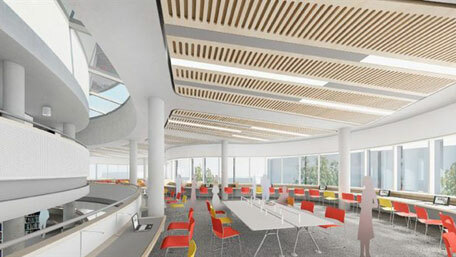 Currently under construction, the project will modernise the library to twenty-first century standards and greatly increase its usability and connectivity with the surrounding area. The project is composed of two main parts: the existing library, with its low ceiling heights, will be thoroughly renovated and joined with a new curved extension that expresses new open reading and study areas beyond. The number of individual and group learning spaces within the library will double and be combined with a new Social Hub catering area. Designed to achieve BREEAM Excellent, it allows the library to remain in use through the entire process. The £18 million redevelopment scheme is now on site and will fully incorporate the existing George Green Library. The scheme presents a significant opportunity to enhance the student experience and respond to the current high demand for student study space. Bruynzeel static and mobile shelving will feature throughout the new extension and the refurbished library, uniting the internal spaces while ensuring that storage space is optimised. The Bruynzeel installation features integral LED lighting on the shelving bays, which provides better illumination than conventional ceiling lights. The development is expected to be completed in summer 2015. Project profile on the Hopkins Architects website. 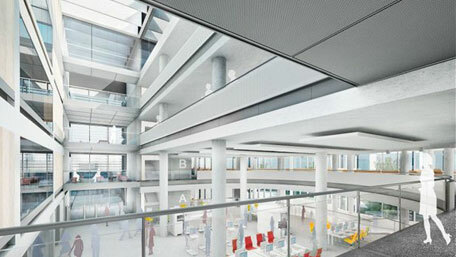 Bruynzeel will supply 6km of static and mobile shelving for the new library. The University campus estates website for the project.